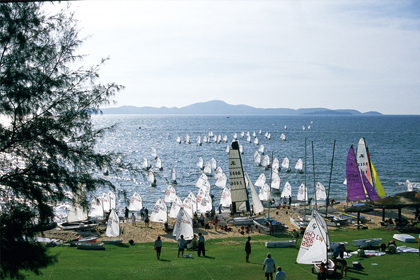 The premier sailing club and centre of sailing in Thailand, The Royal Varuna Yacht Club (RVYC) is located in a secluded cove between Pattaya and Jomtien and is less than a two hours drive from Bangkok. Visit the family oriented club for sailors of all abilities, from the uninitiated to serious racers. We offer a year-round sailing program with cruising and racing. Great facilities include a stunning clubhouse, restaurant, swimming pool, junior club-house, boat storage and accommodation. An ideal place to give your children some freedom in safe surroundings. Rental boats (Laser, Hobie, Optimist, RS Quba and RS Vision) for racing and leisure are available to members and guests. The club offers sailing classes for adults, as well as an extensive sailing program for children during the holidays plus supervised sailing for kids on the weekends.